A sophisticated business WordPress theme that's ideal for any finance or professional services company. Economist is a business and finance focused WordPress theme conceived to give you a professional design to present to clients and industry competitors. We’ve researched your field. 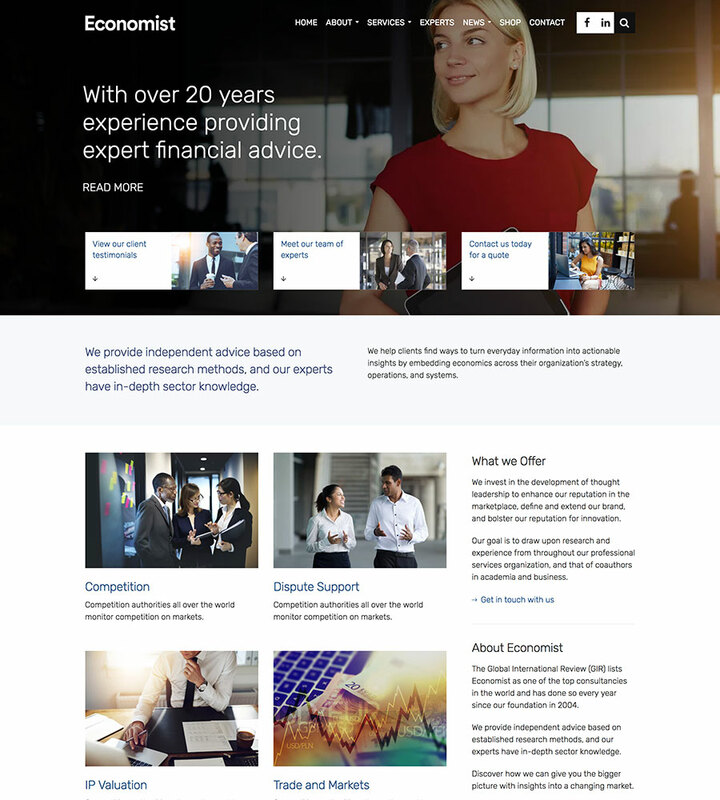 After spending many hours studying hundreds of financial websites we wanted to create a best in class theme. Every element and page has been carefully considered. As a follow up to our best selling Broker theme, it’s a great alternative for your firm. With the included industry-leading Visual Composer page builder you can quickly create and modify designs yourself. The premium LayerSlider plugin allows users to design beautiful sliders showcasing business offerings to customers. Customers can quickly recreate a website similar to our demo site in minutes due to our one-click installer. There’s no need to waste hours reading manuals to get up and running. Simply drop in text and images and the Visual Composer page builder will take of the rest. It’s extremely easy to design original layouts from scratch. Economist is fully compatible with the leading SEO plugin on the market, Yoast SEO. It passes Google’s Structured Data Testing Tool, consequently, search engines will love your site! Buyers rave about our support team due to our rapid response time for tickets. We reply to all support questions within 24-48 hours. Often, even quicker. In addition, the theme includes a comprehensive knowledge base and video install guide. Users can showcase their best work and display client comments due to the beautiful testimonials template included within the theme.